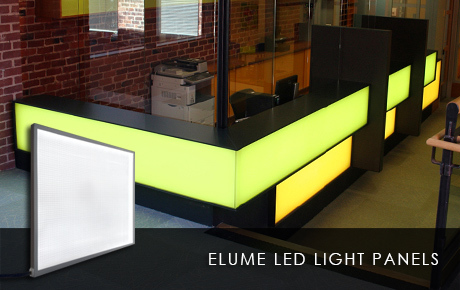 Elumanation custom manufactures all of our LED lighting products specific to your project's requirements. Be sure to contact us as our experienced design associates are glad to assist in determining your ideal aesthetic & sustainable LED lighting solution. From concept to installation, our Elumanation design associates are dedicated to providing the ideal custom LED lighting solutions in regards to your application's specific aesthetic and technical requirements. Precision manufacturing coupled with strict quality control and stringent shipping measures, our design to fabrication to delivery process ensures your order arrives as expected and outpreforms your expectations. Backed by a minimum of a 3 year warranty, we provide the brightest, top tier LED products of superior longevity, energy efficiency and consistent output trusted by international clients of the highest caliber. Frequently shipping internationally we are direct distributors of our products thus eliminating any third party markups, schedule delays or inexperienced resellers. Elumanation is with your project every step of the way. Our ultra thin LED Light Panels are custom fabricated to output a perfectly even, bright, edge to edge illumination across the surface of the panel. Our edge lit optical acrylic sheets are custom manufactured specific to the dimensions and/or shapes that your project requires ensuring the most vibrant and uniform output optimized for backlighting your translucent material. High output, low profile, LED lay-in troffer luminaries offer a more aesthetic, environmental and economical option over traditional fluorescent lay-in troffer fixtures for recessed lighting applications. With four prefabricated traditional models or the option of custom dimensions, our aluminium framed, diffused SlimFixture LED troffer delivers high-efficacy output with longevity and excellent colour matintenace ensuring superior quality for your sustainable general area illumination project. 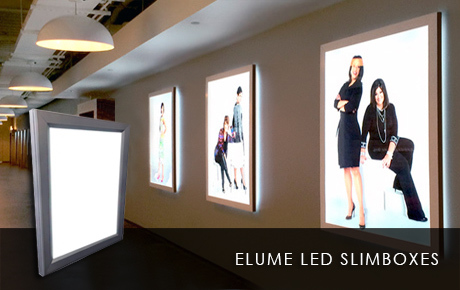 Elumanation offers various LED light box models including different frame styles, functions, mounting options and illumination levels. Coupled with the ability for us to manufacture to your custom specified dimensions, eLumanation is able to accommodate to any of your promotional display LED light box requirements. 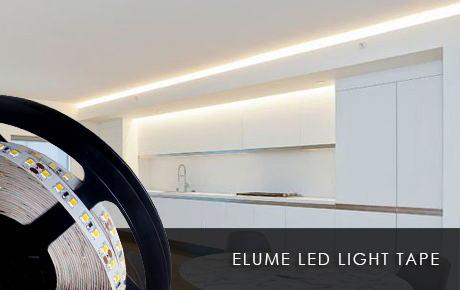 Coupled with various aluminum mounting channel and lens style options our low voltage, Extreme Output LED Light Tape allows for the fabrication of bright, custom LED lighting fixtures for utilization in various linear applications. Light weight, aluminium framed, lay-in LED panel light fixture complete with diffusion lens specifically designed for elevator cab suspended ceilings. 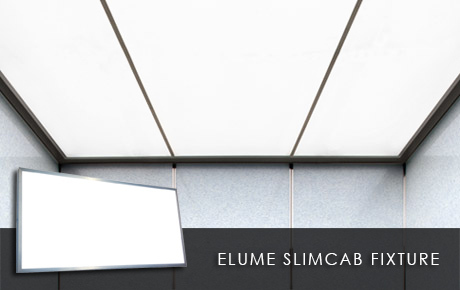 With a low profile of only 1.1" and their ability to be custom fabricated to your specific dimensions, our SlimCab LED Elevator Fixtures are ideal for providing a unique, bright, uniform LED light output in your elevator while in full compliance with elevator safety codes. Our ultra thin RGB LED Light Panels are custom fabricated to output a perfectly even, bright, edge to edge colour-changing and addressable illumination across the surface of the panel. Our edge lit optical acrylic sheets are custom manufactured specific to the dimensions and arrangement that your project requires ensuring the most vibrant and uniform RGB output optimized for backlighting your translucent material. With various reflector options and lumen output levels our suspended or mounted Elume LED High Bay Fixtures are designed for high ceiling heights that require extreme lumen output and performance. 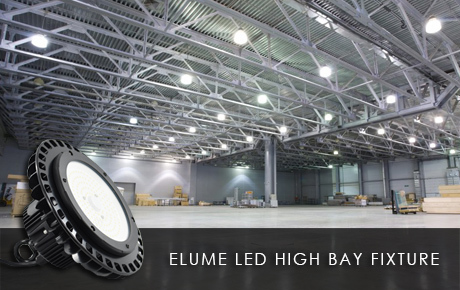 Coupled with an IP65 waterproof and damage resistant exterior our Elume LED High Bay fixtures provide maintenance-free industrial and commercial lighting to help improve safety and energy efficiency while enhancing productivity. A slim linear profile designed for low mounting heights that require high lumen output performance with an IP65 waterproof and damage resistant exterior housing. 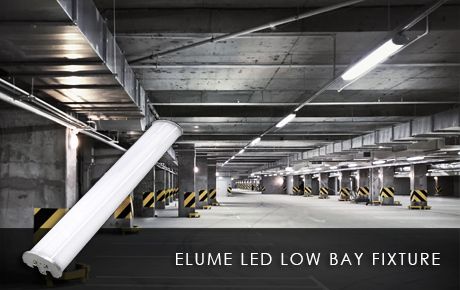 Our various length Elume LED Low Bay Fixtures are ideal for low ceiling manufacturing areas, warehouses, parking garages and tunnel lighting applications. 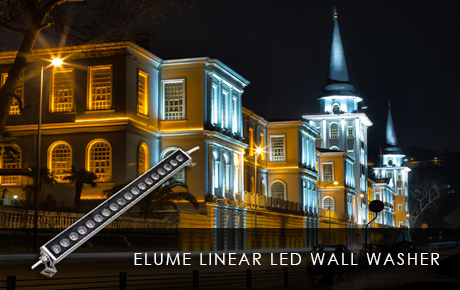 Our exterior rated Elume LED Wall Washer systems cast a high output uniform light to draw attention and illuminate large areas as well as emphasizing textures on vertical surfaces. 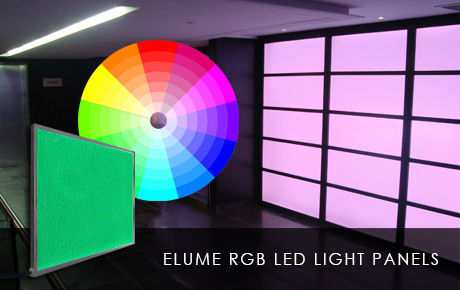 Available in low profile 0.5M and 1M lengths with full daisy chainability in Warm, Neutral, Daylight White and colour addressable RGB light output our Elume LED Wall Washers are ideal in providing high output arhitectural highlights to suit your project's requirements. 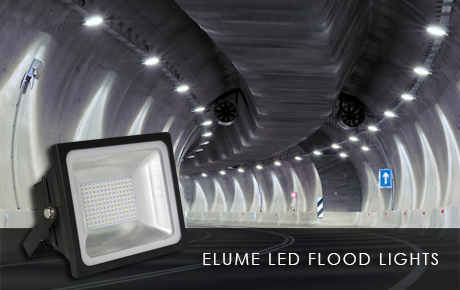 Elume LED Flood Lights significanlty reduce maintenance costs, reduce energy consumption, increase visability and increase security wherever implemented over tradional flood light sources. Available in various lumen and kelvin outputs, beam angles, adjustable mounting hardware, black, silver or white finish as well as an optional daylight photocell sensor to ensure the ideal flood light is specified for your application's requirments. 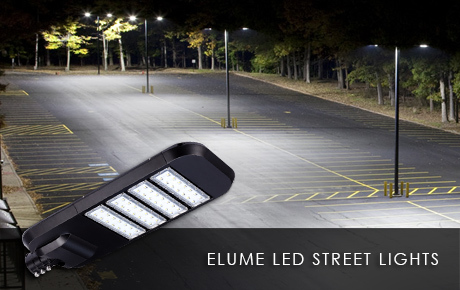 Elume LED Street Light fixture heads significanlty reduce maintenance costs, reduce energy consumption, increase visability and reduce light pollution compared to traditional street light sources. Available in various lumen and kelvin outputs, beam angles, adjustable mounting hardware, black or white finish as well as an optional daylight photocell sensor to ensure the ideal street light fixture head is specified for your application's requirments. 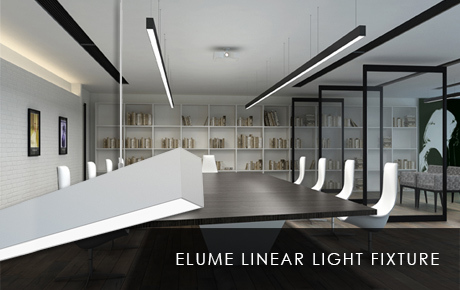 With 3 standard lengths as well as custom dimensions with a minimum order quantity and with the fixtures ability to be suspended, recessed or mounted our Elume Linear Light Fixture allows for unique configurations and arrangements to best suit your project's aesthetic objectives. 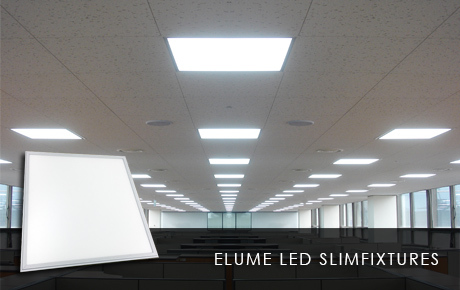 All of Elumanation's LED light products are fully dimmable when paired with our proprietary dimming module components or witha dimmable power supply. 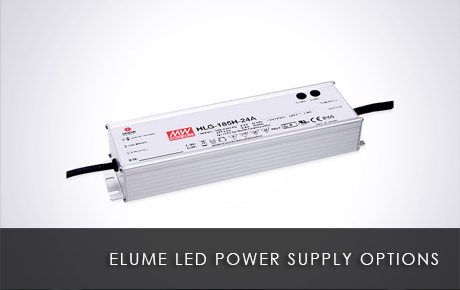 If dimming is not achieved internally via the power supply Elumanation offers two secondary dimming control options to best suit your application's requirements. 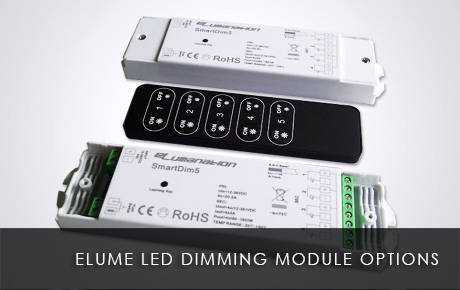 Our hardwired VDim module option which operates off an external 0~10Vdc control signal dimmer switch or our wireless, handheld remote controled SmartDim dimmer module option. Elumanation offers plug and play models for simple/quick installation or higher load hardwired power supplies to best suit your application's requirements. After discussing your project with an Elumanation associate we will specify the ideal power supply suitable to your installation and load requirements. © Copyright 2015 by Elumanation Inc. All rights reserved.